With the exception of writing about interest rates. I do make a concerted effort to have content on my blog be fresh and try to avoid repetition. With that being said, however, there is only so much one can write about that is novel and insightful. So I’m going to overtly violate my rule and discuss something that I have already written about previously. And that subject is Van Morrison. I saw Van Morrison a couple of years ago with Roneet and another couple in Las Vegas. It was wonderful and I was really moved by the entire experience such that it inspired me to write about him and how one should focus on meaning in life and not retirement as Van was still going strong at 71 (and continues to do so two years later). But that was then and this is now as I am in a very different place in life. Even without the passing of Roneet, I would still be in a different place because, as I like to paraphrase Heraclitus, you can’t step into the same river twice. This is the case because not only are we always changing but so too is the environment and both impact each other such that we see with different eyes and our experiences are altered. With that being said, much of our changes are more subtle and harder to detect without the benefit of time and reflection. The passing of Roneet, however, was quite radical, unexpected, and life-altering in an instant. As previously mentioned, the last time I saw Van Morrison I was there with Roneet as my wife, partner, and best friend. I felt such joy from introducing her to new experiences, particularly musical ones. 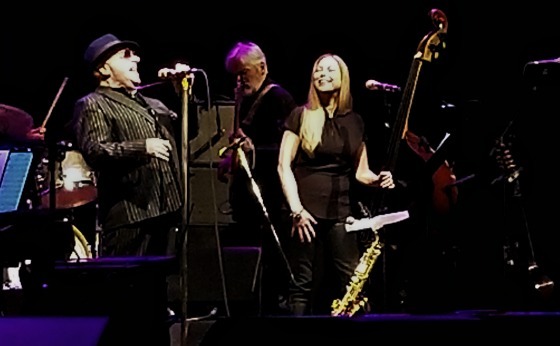 The Van Morrison show was particularly gratifying as she did not know Van that well but she left the concert mesmerized, so excited to have experienced it, and wanting to go again. That was a small contribution to our continued growth together. She became increasingly open to new experiences and trusting one another to go with the flow despite this not being in her nature whatsoever. She would tend to go into new things kicking and screaming and, after finally getting her to try it, like most of us, found that hey, maybe it wasn’t too bad and she actually even liked it. I admired her courage for doing things that were so against her natural instincts knowing that it was gratifying to me. So why is Neil Young featured in the title of this blog when the focus is on Van Morrison? It’s because the concert triggered a powerful connection to a Neil Young song that I wanted to share in this post and represents another insight as I work through my mourning and recovery process. Besides being another long enduring, highly successful, innovative musician and writer, one of Neil’s songs in particular really helped frame the magnitude of the loss I’m contending with. I have in some ways put myself a bit in the backseat of the grief train by telling myself that my loss in some ways is less traumatic than my kids’ since they can never have another mother, as well as Roneet’s sister, who can never have another sister, and for her parents for whom losing a child is so unfair and out of the natural order such that the void of her passing can never be filled. Neil Young shifted my thinking, however, vis-a-vis my grieving process. It was then that I had this epiphany that one of the most important components of a home and a powerful relationship is that all of your changes are there or with that person. And it’s for this reason that I’m moving my seat forward on the grief train. And while I had a great time at the concert, it was obviously in Roneet’s absence and reminded me that I will no longer be able to add to our collage of experiences which formed an ever evolving and changing, but particular, picture of our lives that were so intertwined. But that’s now gone and my future growth and changes will be occurring without her and that is frankly a very daunting and sad realization to process. All is not lost, however, as I am blessed with having such an amazing family between my kids, Roneet’s parents and sister, as well as my siblings and mother. And while all of my changes were much more deeply intertwined with Roneet, my family has been witness to them as well and know me very well too. They have been remarkably comforting, giving, communicative, open, and helpful and I will forever be thankful and blessed to have them in my life. Roneet was the person that brought us all together and she was the glue and, even in her physical absence, she will always be the glue through her incredible commitment to staying connected with the most important people in her life and bringing them together. We will always love each other and be close. And yet, I am still reminded that it is something that I’m going to have to work through because I had a life partner, who knew and understood me, for better or worse, and instinctively knew what was best for me and how I could grow and become a better person. Now I have to utilize that strong voice of hers in my head to help keep guiding me in this roller coaster of life and always ask myself what would Roneet do? And this is why art is so important. I gained greater understanding, self-awareness, and insight about myself and what I am trying to work through and it was all because of a beautiful song written nearly 50 years ago that still resonates today. That is what great art can catalyze and facilitate. I will wrap up by reiterating that I had a really nice time at the concert. It was different, as every experience going forward will be without her. I would think of looking over at her and seeing her dancing in her own special way, smiling, and afterward, the two of us comparing notes about the concert and completing the experience by listening to his music together afterward. Those thoughts made me smile as well as made me feel a little sad. But I still was able to lose myself in the music and enjoy myself. I know that it will never be the same but I can’t let that get in the way of me enjoying life and seeing wonderful artists and musicians like Van Morrison. And I know there will times that the grief will hit me in ways that will leave me feeling helpless, but I also know that I have wonderful family and friends to whom I can turn as my changes continue to unfold. Roneet was lucky to have you and vice versa. Beautiful message. Best wishes in processing the changes ahead and allowing grief and gratitude to both express themselves as needed. The last time I saw Van was in a tavern (saloon) in MillValley. So awesome. Neil, adore him. Cow Palace: SOLO performance. Such depth of talent. Most of all, Roneet’s star in my heart is shining so brightly TODAY. she taught me much I needed to know. All these years I’ve only read specific news sites with regard to global changes.